It’s my late entry for Ruby Tuesday; cause it’s already Tuesday night here. I was out of home all day; preparing plane tickets and other stuffs, as we will go to another town next Thursday. Sigh, I can’t get cheap plane tickets. I prefer to go by train, but my father’s condition isn’t fit yet to take longer journey. 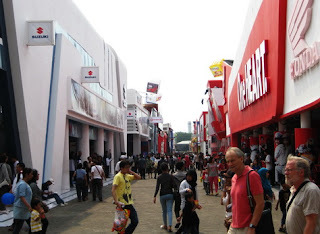 Anyway, about a month ago, we went to Jakarta Fair. 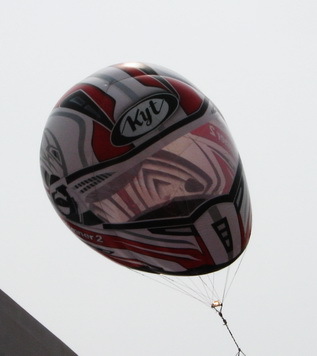 There were flying helmets that attracted my attention. I share it one here. An interesting marketing tool! Hope everything is fine with your Dad. That vacation is good for him. Have a safe trip! Markets are great places to find red in all its variations! Great find for Ruby Tuesday!